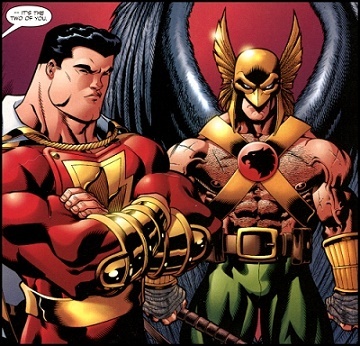 This mini-series reunites DC veterans Adam Strange and Hawkman, whose paths have crossed before. With their original encounter in 1970’s Showcase. Adam Strange was first created in 1958 by Gardner Fox and Dennis Neville. While Hawkman’s early character development is a little more convoluted. He first appeared during the Golden Age in 1940 as a Flash Gordon-esque persona, created by Murphy Anderson and Julius Schwartz. Originally his birthplace was in ancient Egypt, but in 1961 the character profile was substantially reworked, becoming an alien police officer from the planet Thanagar. In the characters back story, Strange was an archaeologist from Earth, who was teleported mysteriously to the planet of Rann. He made the acquaintance of his later beloved Alanna and in time became the planets defender. 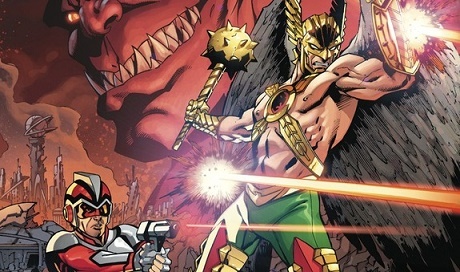 The upcoming Hawkman and Adam Strange Out of Time series sees the classic duo once again form an unlikely partnership. Adam Strange travels to his adopted planet of Rann, only to find the city of Ranagar in ruins after an attack. Strange had been residing on Earth retired from the responsibilities of being a superhero, he now finds himself thrust firmly back into the action. In 2005’s Rann-Thanagar series published by DC Comics, the movement of the Rannian planet manoeuvred Thanagar, the home world of Hawkman, closer to the sun and wreaked havoc on the plants surface (this was later discovered to be the work of SuperBoy Prime). Many on Thanagar blamed the Rannians for the damage to the planet provoking a war. This episode instigated another earlier collaboration of Adam Strange and Hawkman. In Hawkman and Adam Strange Out of Time, the Rannians are holding responsible their long time enemy, the Thanagar, for the attack on Ranagar. Following imprisonment on Rann as an alleged spy, Adam Strange is unexpectedly rescued by Hawkman and thus they form an alliance. Issue #1 of the Hawkman and Adam Strange Out of Time six-issue miniseries is written by Marc Andreyko and the artwork is by Aaron Lopresti. The title will be available from 28th September.